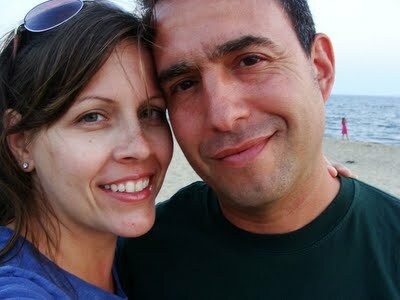 A few weeks ago, Jennie Perrillo of In Jennie’s Kitchen lost her husband, Mikey, to a sudden heart attack. Literally – SUDDENLY. He was helping their youngest daughter ride her bike, told her he needed to sit for a minute and then died. There were no goodbyes. No heads up. At 5:52 p.m. one Sunday, Mikey was just gone. As I type these sentences, I am brought to tears again at the thought of the devasation felt by Jennie and her girls. I was up late working that Sunday night and saw tweets mentioning Mikey, then went to Jennie’s blog and watched this video of Mikey dancing with their daughter. Without even knowing yet what exactly had happened to him, there I was – tears from head to toe immediately. I woke my husband up and hugged him. Since Mikey died, I’ve been following Jennie’s struggle on Twitter and her blog. There are messages of hope, sadness, anger and strength. Jennie amazes me. She seems to have lived her life with Mikey to its fullest. Every moment has a memory – a story. Jennie is a reminder to me to live in the moment, to be present and to appreciate every second of life that I am given here with my husband, my daughter, my parents and family. It can all be taken away in an instant. I’m thankful for the reminder but wish it could have come to me without such pain for this wonderful woman. As you can imagine, Jennie is overwhelmed not only by her grief, and the sudden responsibility of raising two children by herself, but she is also struggling with this financially. She just learned that she cannot collect widow�EUR(TM)s benefits from Social Security because she earns too much money each year. The health insurance for her and her kids runs out in December and she just learned that the total she will have to pay will be more than her mortgage. It�EUR(TM)s possible she�EUR(TM)ll have to pay off the entire mortgage in one lump sum because the apartment was in his name alone. And more than anything, Mikey wanted Jennie to continue living her dream of being a food writer. And he wanted to make sure his kids were taken care of well. That�EUR(TM)s why he worked as hard as he did. I am hosting an Auction for A Fund For Jennie. The deadline for Bloggers Without Borders program has passed, but 100% of the proceeds from this auction will be donated to A Fund For Jennie. Leave a comment below with your bid or email me at nithyadas1@gmail.com with your bid. Bidding ends on Sunday, September 11, 2011 at 11:59 p.m. ET. Spice basket and books will be mailed to the hightest bidder to any location in the U.S.
Leave a comment below with your bid or make a donation directly to Bloggers Without Borders. Update: We raised $200 for A Fund for Jennie. Thanks everyone! for *a* couple of years . . .
Hi SP, thanks for your email! So nice to hear from you and it’s always great to hear that these recipes are benefiting others 🙂 Appreciate the comment!